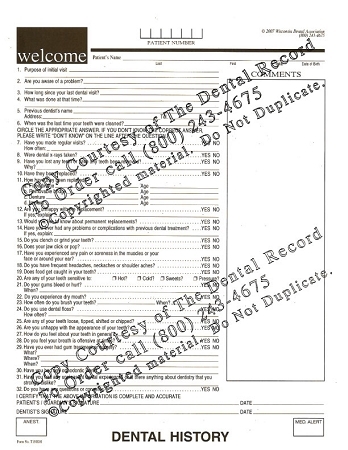 The Dental History form is important because it records the patient's purpose for the initial visit. 100 forms per tablet. This form is used for adults and provides you with dental information about the patient, their dental history and experiences through the use of a series of questions designed to generate a "no" response. All "yes" or "don't know responses should be reviewed by the dentist or an auxiliary to clarify the situation. Space is provided on the right side of the form to record responses. This form also includes a medical alert box and an anesthetic box. Tablets of 100 single-sided sheets , pre-punched and cut to fit.